Home Eats 3 Ice Cream Shops That You Definitely Need to Try in McAllen! 3 Ice Cream Shops That You Definitely Need to Try in McAllen! National Ice Cream Day is upon us again, and we are SO ready for it! This summer has been quite a scorcher, and we’re thrilled to have an excuse to go out and get some ice cream to cool down. Check out this list of some of McAllen’s best ice cream places that you absolutely NEED to visit this weekend! What once began as a food truck at McAllen’s Food Truck Park, Rolling With Cream has since grown into an actual ice cream storefront located on Nolana Ave. across the Hollywood Cinemark Movie Theater. Famous for their Thai-inspired ice cream rolls, they’ve definitely helped revolutionize not only what ice cream typically looks like, but how it tastes as well. All of their ingredients are natural: fresh fruit with no bonding agents, artificial ingredients or preservatives. Their flavors are unlike anything you’ve had before. You’ll be craving more after one taste! For store hours, call 956.363.6118. The founders of Ice Cream & Bananas wanted to create something that would cool people off and cater to all ages. They were definitely successful in doing so with their shop, and you can find their homemade, artisan ice cream at McAllen Farmer’s Market at the McAllen Public Library every Saturday morning from 10:00 AM until 1:00 PM. They also collaborate with CC’s Sweets & Tweets and fill some of the bakery’s famous jumbo macarons with their ice cream to create the tastiest ice cream sandwiches you’ll ever find! For more information go to their Facebook. You can find their artisan ice cream at CC’s Sweets & Tweets. This cupcake shop offers ice cream in addition to their moist, delicious cupcakes. They make 15 flavors of ice cream daily in small batches, and their flavors mirror their cupcakes. A fan-favorite is the 24 Karrot, which is basically cream cheese ice cream infused with carrot cake cupcakes. Our mouths are watering over here! One of their most popular items is the Cupcake Smash: a cupcake, cut in half, and filled with ice cream. For more info on their ice cream goodness, send them a message on Facebook! Show us how you’re celebrating National Ice Cream Day in McAllen this weekend! 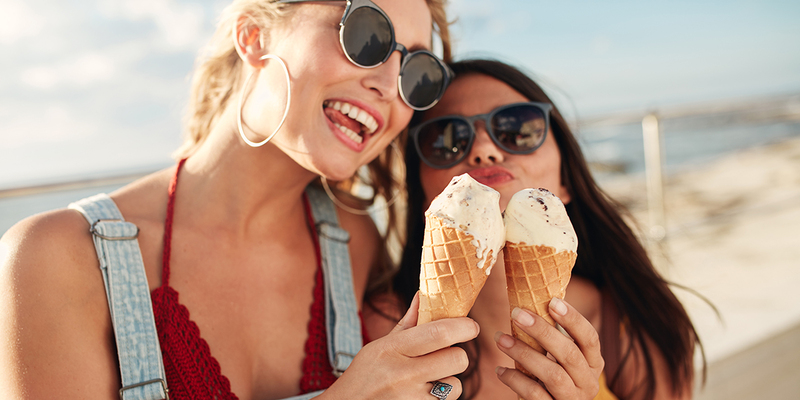 Head out to any of these places, snap a photo of your ice cream and post it on Instagram with #McAllenEats. Get creative with your photos! We love to spotlight our Explorers on Instagram, so this is your chance for a feature! Stay cool this summer and enjoy your weekend at some of McAllen’s best ice cream shops! Next articleDive into the World of Sharks with IMAS!